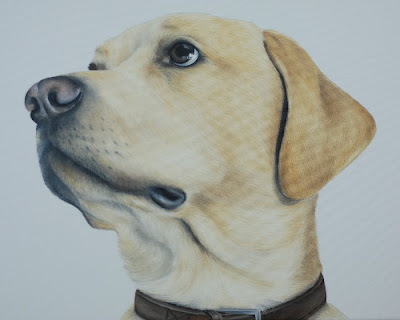 Apologies it seems a while since I did a blog and there's been lots of lovely portraits painted in the last few months which I need to get on the website, so thought I would make a start and what better way to do it than with this gorgeous boy. Some of you may remember a while back I painted a rather adorable puppy labrador called Chunk, well he has grown into a very handsome boy and I had the pleasure in doing another portrait for his lovely owner. It was such a great experience doing this painting and seeing how he has changed since a pup, and I think you would agree he is definitely one gorgeous pooch. What is also interesting is seeing how my painting has developed in that time, as some of you know I have now been doing this full time for 2 years which means I have been able to take on a lot more commissions, the more I paint the more I learn and I feel I develop so much each portrait I do. Every one I paint is different and has it's own challenges, even when it is the same dog! I hope you agree but I do believe I am improving with each one and can only thank all my lovely customers!